← Alexander the Great – The epitome of siege Equipment in the battle of Tyre and a little boasting. The siege of Gaza occurred in 332 B.C.E. at the city of Gaza. Gaza is a coastal city on the Aegean coast (Fig. 1). Gaza posed a significant challenge because it is located on a plateau that rises up to 60 feet over the surrounding areas. The siege was between Alexander and his 45,000 strong force of Greeks against Batis, King of Gaza and his 49,000 soldiers of the Achaemenid Empire. Around October of 332 B.C.E. Alexander the Great was on his march south to Egypt in order to secure his flank before marching across the Middle East on his mission of World Conquest. Alexander wanted to shore up his rear In order to avoid having issues behind him so that all of his focus would be in front of him. One of the cities on his path was Gaza, which was ruled by Batis, who was loyal to Egypt. Alexander arrived at Gaza and quickly spotted the southern walls as the weakest point in the city. Thus he set his siege sights on that part of the city. He quickly built up mounds from which siege weapons would begin to batter the walls. Batis knew that Alexander was coming for Gaza and had therefore provisioned his city in order to withstand a long siege, hoping for the arrival of the Egyptian army to meet Alexander in open battle. It took 3 unsuccessful attempts to capture the city before Alexanders forces stormed the city and was able to finally bring the city to its knees. When the city fell the men were “put to the sword” and the women and children sold into slavery. This was the last major obstacle on the Aegean coast for Alexander. After the city fell Alexander was able to successfully claim Egypt and begin his march across the known world. Bosworth, A.B. Conquest and Empire: The Reign of Alexander the Great. Cambridge: Cambridge University Press, 1988. Web. Wikipedia. 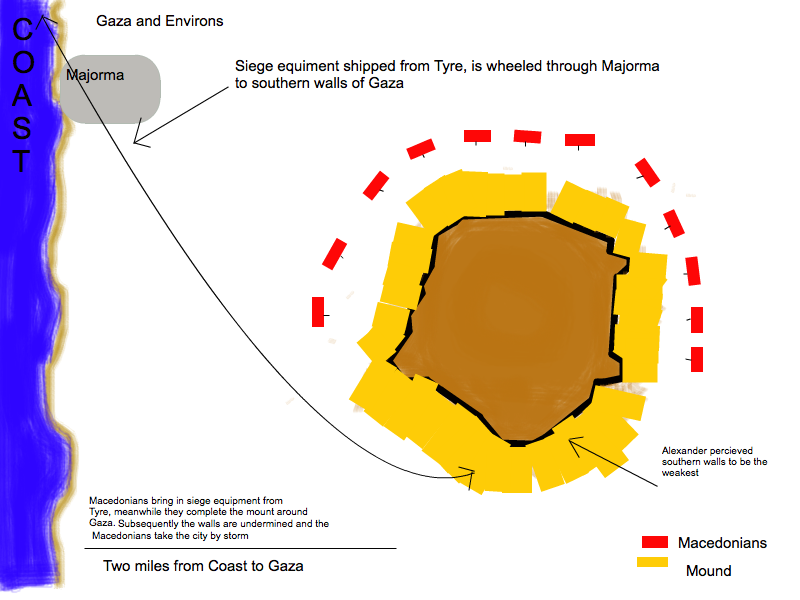 Siege of Gaza. February 2012.